Last week I went down to London for two days of sheer luxurious indulgence. It was perfect. 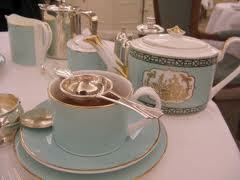 First on our agenda was afternoon tea at Fortnum and Mason. We popped in to Hatchards for a quick browse beforehand so that we could pretend to be proper Heyer heroines. Then we admired the tea and food on sale on the ground floor and I salivated at the chocolate and sweetmeats counters. Upstairs we were careful not to let our bags knock the wildly expensive crockery off the display tables in the kitchen/dining department. And then we took the lift to the fourth floor and the Diamond Jubilee Tea Salon. As we arrived, someone was playing on the grand piano. A member of staff took our coats and my overnight bag to the cloakroom and then we were shown to our table. They serve 82 varieties of tea at Fortnums and to help guests try some of the more unusual kinds, they offer a tea tasting. Four kinds of tea (rotated on a weekly basis) are brought to the table and a bowl of each is made for you to try. We tried two green teas, a Darjeeling, and (I think) an Assam. The green teas were spectacular and F. ordered both to have with our tea, while I went for my favourite Countess Grey and a glass of pink champagne. The tea menus have a set price and you can have as much food or tea as you like with them, which gave a wonderfully sumptuous feel to the event. I had the traditional afternoon tea: sandwiches, scones and cakes. Which in no way does justice to the food I ate which was heavenly and so beautifully presented. I had five kinds of sandwiches, presented with the fillings upright and colour co-ordinated from deep pink (salmon), pale pink (roast beef), pale yellow (egg), pale green (chicken and tarragon), deep green (cucumber). There were fruit and plain scones, served with lashings of clotted cream (we ordered extra and had far too much), and fresh lemon curd or jam. Individual cakes were chocolate and rose, lemon and praline, and vanilla and cherry. And there was a homemade jammy dodger. Plus there were large cakes you could have slices from but my appetite failed me at that point. There are two other menus: a savoury afternoon tea which substitutes various canape-type things for the cakes, and a high tea which substitutes hot savoury dishes for the sandwiches. F. had two dishes from the high tea menu, scones and no cakes. She chose Welsh rarebit and a lobster truffle omelette. I didn’t try the Welsh rarebit though it looked delicious, but I did try the omelette which was one of the best things I have ever eaten ever. SO GOOD. The staff were brilliant, constantly checking that we had enough of everything – more sandwiches, more scones, more cream, more cakes, more tea…. We did not eat again until the next day. After tea we had thought it would be nice to go downstairs and buy some of the teas we had enjoyed drinking. F. bought me 150g of the Countess Grey. Then she asked for the green tea she had most enjoyed. Which turned out to be £500/kilo. Um, no. But it did make the afternoon tea seem even better value than before. It is not cheap, but I’d say it’s worth it. Anyway, we then went to try on hats, smell perfumes and such like before changing into sparkly outfits in the loos for the next stage of our adventure.